This days, if it isn’t monster, then it’s not a device. Oukitel U23 is another monster device to look out for launching soon. OUKITEL U23 will feature 6.18-inch notched Full HD display, with 19.5:9 aspect ratio. It comes with Panda King Glass protection and weighs just 201g. The device comes with 6GB of RAM + 64GB onboard storage, dual rear camera of 16MP + 2MP with Samsung S5K3P9 sensor, 8MP selfie camera and it will run Android 8.1 Oreo out of the box. 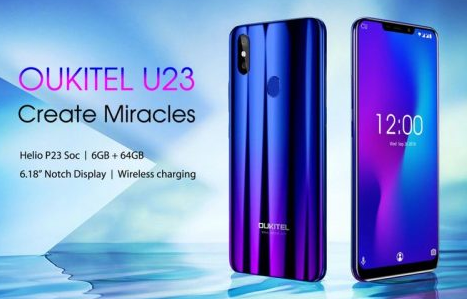 Oukitel U23 is powered by a battery juice of 3500mAh capacity with support for 5V/2A fast charge, Qi wireless charging. Likely to be available before Black Friday 2018. It’s like the batteries of these monster devices ends up being their Achilles heel. Great specs overall but I wanna know who’s in charge of selecting the battery capacity! d graded colours at d back is cool but i will choose Xiaomi Redmi Note 5 over this. It is over priced. I got cubot power with 6000mAh, 128gb Rom, 6gb ram on Jumia for a lesser price. Have You Heard of Glo Campus Data Booster Zone?